This sizeable, sporty chrono watch has a 44 mm stainless steel case and is water-resistant up to 10 ATM. 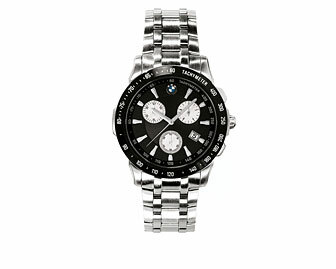 Other highlights include a black and white watch face with a raised BMW logo and a precise Swiss quartz movement. Mineral glass for scratch-resistance. With stopwatch function, date display and small second display. Durable stainless steel strap with metal clasp. Laser-engraved BMW logo on the back.